A Tonk's Tail... err, Tale...: Tree Dweller, Bush Dweller, or something else? We're taking a few weeks' hiatus from Medical Mondays, due to Real Life workloads! They'll be back in a few weeks, we promise! 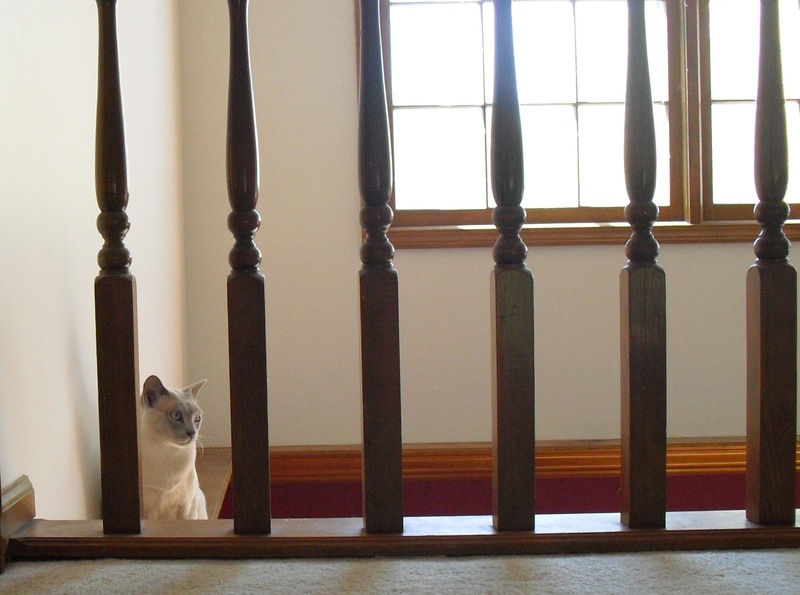 Have you ever noticed your cats have an affinity for a certain elevation? Ours certainly do! 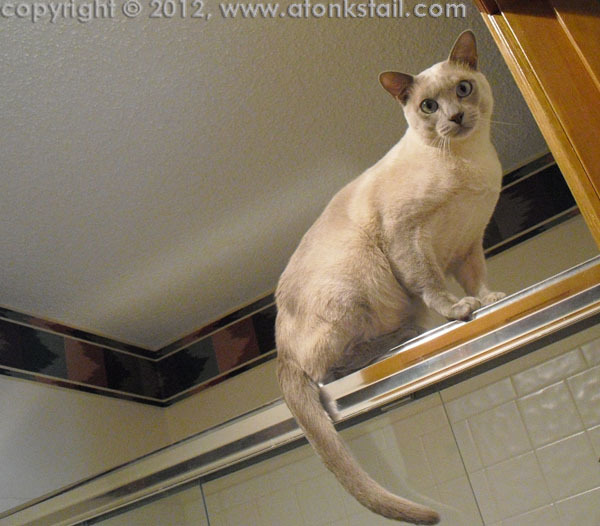 Tonkinese are known to be athletic acrobats, and Faraday fits that description to a "T". He's also the most vocal (man does that cat have lungs!) and he craves attention. So when he tackles flights of derring-do, like tightrope walking along the top of the shower door, he announces it... loud and long! Allie is a middle of the ground chick. That is, unless she's being chased up a tree by three huskies (dogs who were off leash and terribly against city ordinance!). Poor girl shredded her mani/pedi that day. It's also another reason she never goes out if we're not within 3 feet of her. But on an average day, she loves hanging around with us in the garden, either at street level or up at eye level with us while we're out in the yard, sitting on the railing of the deck. Though she has been spotted by paparazzi lurking in high places such as closet shelves - usually to get away from The Brat (aka Faraday) - that's not her normal Modus Operandi. Maxwell's a wanna-be tree dweller, but with his deafness, he's off balance and awkward. He does make it to the top of the refrigerator, but not without careful measurement. He can usually be found lazing around under the kitchen table or on the foot of our bed. Or banging around in the kitchen cabinets. Yeah, he figured that trick out in a hurry - just take a look at the video below. Makes for some interesting noises at 3 AM - and completely redefines the whole concept of "things that go bump in the night"! Jackson Galaxy (of Animal Planet's "My Cat From Hell" TV fame) labels these cats Tree Dwellers and Bush Dwellers. Not sure what he'd call Allie - or maybe she's the Bush Dweller and Maxwell would be the Ground Pounder? What impact could this have on the cats in your home? It can possibly mean the difference between peace and World War III if you have cats who don't get along. What I mean is, if one cat is picking on another and the beleaguered cat has vertical spaces he or she can escape to, those vertical escape routes could help disarm a cat fight. Our cats have three superhighways in our home. The first one came built-in. Our upstairs is divided into two living spaces. In between those spaces is a two-story-tall open area. A hallway with railings connects one living space to the other. 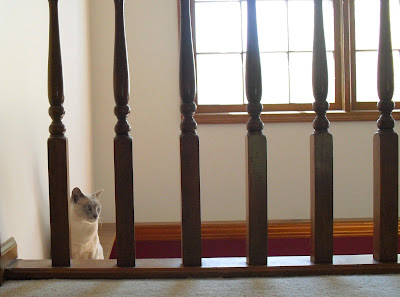 At about the same level of the hallway is a 6-inch wide wooden moulding that frames the kitchen eating area below - perfect for kitties to traverse. For years, I blocked it off. You see, not long after we moved in, Ryker sauntered out to grab a sun puddle, fell asleep, then promptly fell off. He landed 8 feet down, on the hardwood floor below. He broke his elbow and got a busted lip! Then came the Terrible Two - Faraday and Maxwell. Nothing stopped them, they just climbed over my barriers! At about that time, Jackson started talking about the benefits of a kitty superhighway, so down the barriers came, and all three cats have been happily running a circuit around the kitchen, 8 feet off the floor, ever since. The second superhighway was semi-built in ... as are most walk-in closets. We just added a series of shelves off to the side for easy access. Superhighway #2 is Allie's preferred escape route when Faraday gets a bit too obnoxious. Superhighway #3 was created from scratch using shelves purchased at the local home improvement store. Be sure to add a non-skid surface to your shelves for better traction. Superhighway #3 is in a guest bedroom. I have to admit, this one only seems to get used when we happen to be in there. We learned a lesson with this one. Cats don't enjoy the same reputation with the general public as 'social animals' that dogs have, but many certainly are! 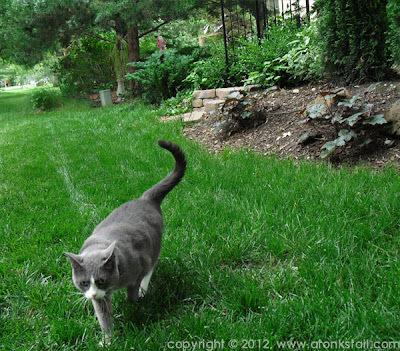 No matter where Marty or I go in the house, we can usually count on all three cats showing up within a short time. (Unless one or more is napping - then all bets are off!) So we'll install our next superhighway in a location where we spend more of our time. 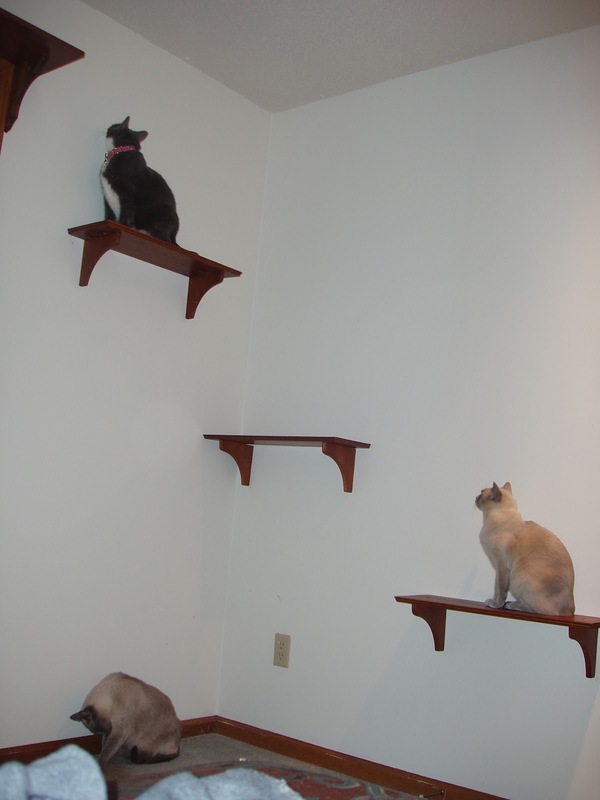 Do you have any kitty superhighways in your home? Are you cats tree dwellers, bush dwellers or somewhere in between? Do you feel those differences enhance their ability to live harmoniously in the home? Our foster, Lexi, loved high places!! Mom would find her in the strangest ones!! Harley and I both love being up high. 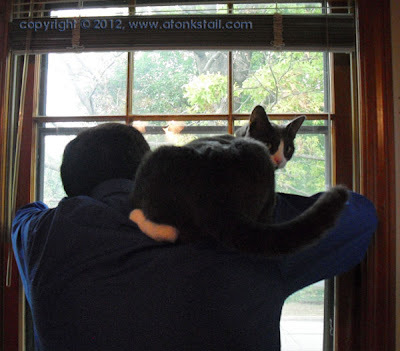 We got these special Curve perches that let us climb way to the top of the kitchen cabinets! Suey is the tree dweller in our house. She likes it up on top of the wardrobe, especially when we have guests or there are noises or workmen outside. We boys tend to stay closer to the ground. We like the kitchen table, and tend to stick to that same height on the cat trees. Your superhighways look fantastic! There's no WAY we could all live in our little house without our skyways! Several of us spend all day snoozing in the "way-ups". All of the kitties are pretty much "in between". Thankfully everyone gets along with each other. We did consider adding shelves much like what you did but we are still trying to figure out the best spots to do so. that video was hilarious. Cody does the same thing but doesn't have the luxury of sharing his accomplishment with another kitty lol. Cody is a combination of tree and bush dweller. Depends on his mood! Boodie is the bush-dwelling cabinet opening kitty here - with her "cobby" build, she is not much of a climber. Binga and I always want the same places, more on more of a high ground. 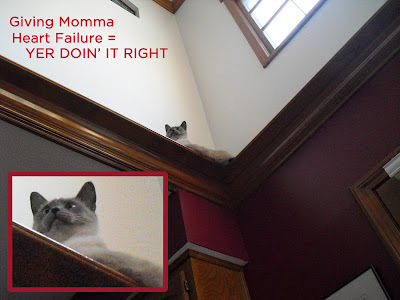 In fact, Binga once climbed on the beams of the living room ceiling! My human blocked that off (unintentionally) by creating too much clutter on her jumping off point. Bailey is definitely a bush dweller, she loves to be in one of her many beds scattered across our home. She does love her window perch though. Tatiana is mostly a tree dweller, but if something scares her, she's a bush dweller! Very interesting information. We don't climb too high because of our short little legs (Persians), but we do like our cat tree. I jump all over the furniture and can usually walk the entire living room without touching the floor. I don't have special shelves to jump on but would love them I'm sure. For than anything in the world, I want to get on top of our crawl space but the peeps don't want me up there for some reason. Sigh. I don't open closet doors. I prefer to scratch on them until TW opens them for me. That is a VERY cool super highway you've got! So what's the posted speed limit? I bet FaRADaY has a radar detector, doesn't he? All my cats are bush dwellers who take turns (most of the time) monitoring window sills and the door wall. Livia mans the fourth floor penthouse of their kitty cottage. The super highway is from my bedroom window sill down a hall (speed!!! zip!!!) and around my dining room table. Sometimes, there's a highway detour that goes across my bed, using me as a speedbump. I enjoyed your cabinet video. It's nice to know that Abbi and Livia aren't the only cabinet bangers in kittydom! We all like to be up high. Our highway is in the kitchen. We run along the cabinet tops. There's a door between the pantry cabinet and the other cabinets and we used to jump across. Mom put a shelf up so we don't have to jump anymore.